Bay Engineering is a highly skilled manufacturer of precision engineered components and fabricator of machined parts and welded assemblies. Precision defines everything we do, from our meticulous approach and highly efficient processes to delivery of the final product, on time, on budget and made to fit perfectly. In today’s highly competitive world, customization is key to innovation. Adopting a flexible approach that can be adapted to our customers’ needs and requirements is precisely how Bay Engineering adds value. Compromising on quality is never an option but when it comes to quantity, we’ll make whatever our customers require. Producing 1000s of individual parts as well as highly complex assembled components, Bay Engineering’s services range from CNC manufacturing and steel fabrication to advanced turnkey solutions. A small company with big capabilities, Bay Engineering does everything from creating prototypes for new product development to improving the design of existing products. Bay Engineering delivers an end-to-end outsourced manufacturing solution in the world of precision engineering. Empowerment has always been at the heart of Bay Engineering. This has been exemplified in the recent investment by The Black Industrialists Group resulting in a fully transformed company and a level 2 for B-BBEE purposes. We understand that our employees are our most valuable asset, which is why we’ve invested heavily in their growth and development from the very beginning. Today, Bay Engineering has a 50% Black representation in both executive and management functions and a 90% representation on the shop floor. We are a 51% black owned business and a level 2 B-BBEE contributor. Over the years Bay Engineering has not only developed a wide range of skills and abilities, but increased our capabilities and put highly efficient processes in place to ensure our customers receives quality products, which are competitively priced, and delivered on time. 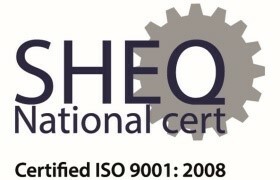 This is achieved through our ISO 9001:2008 certification, adhering to these requirements and committed approach to ‘Doing it right, the first time’. Striving to be a World Class (Level 3) Supplier of Outsourced Manufacturing Solutions, Bay Engineering has developed a safety conscious culture with the goal of achieving an accident free workplace. Following the completion of the Workplace Challenge Program, which integrates continuous improvement in the key areas of Quality, Cost, Delivery, Safety and Morale, Bay Engineering received an Award for Outstanding Performance. If you would like to find out more about our precision engineered components, please contact us!